alaTest has collected and analyzed 26 reviews of Sony MPK-AS3. The average rating for this product is 3.5/5, compared to an average rating of 4.1/5 for other Camcorders for all reviews. We analyzed user and expert ratings, product age and more factors. Compared to other Camcorders the Sony MPK-AS3 is awarded an overall alaScore™ of 84/100 = Very good quality. Great product, but no spare parts. After one use, an O-ring got a cut on accident, and we find out Sony does not supply this part. Bought this casing because planning a trip to go scuba diving and all I have to say is good thing I purchased it early this case does not fit the HRD-AZ1 model. Whats is the point of having a underwater casing if it does not fit all models? Works excellently. Took it diving at Grand Turk down to a max of 70+ feet for at least half an hour. No fogging and no water. 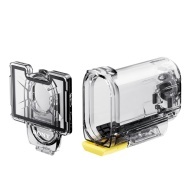 Great product helps focus the camera under water.